One of the most frustrating things about living in New York City is the lack of outdoor space. Sure, there’s Central Park and a variety of restaurants with back patios for outdoor seating, but what about a nice patch of grass in the backyard where I can drink my morning coffee in PJs without terrifying other park goers with my lack of makeup and bed head? That’s right. I got nothin’. So to make up for my nonexistent backyard and subsequent lack of a grill, The BF bought me a grill/griddle pan. It’s this magical device that sits over two burners on your stove and basically gives you a nice, grill-marked crust on various meats and veggies, while on the other side waits a griddle for pancakes. It’s a New York City home cook’s dream. This dish was created on such a grill pan, and you’ll find the full recipe over at Spice to Meet You. Which brings me to my next point. I’m super fortunate to be guest blogging over at Spice To Meet You for the next few months. I’ll be contributing recipes and possibly video posts to the blog, and basically pushing this AWESOME service on you. I don’t hawk anything I don’t truly believe in so I’m really serious when I tell you to go take a peek at this monthly spice delivery service that also gives you access to delicious recipes that show you how to use said spices. The monthly service starts at $6 a month (hey perfect birthday/mother’s day/father’s day gift) and the perfectly blended spices can be used on anything… anything like BBQ pork chops. Just an idea. The site is also offering a one month free trial! So you really have nothing to lose by trying it out. Go on. Go now. So sorry for the radio silence lately (although if there had to be an image stuck at the top of the blog, why not scones, am I right?). I am fully employed now (WAHOOOO PAYCHECKS!) but that means significantly less time and energy devoted to Food E. It has seriously taken my body about a month to adjust to waking up and actually getting out of bed in the morning, going somewhere for 9 hours, and then returning home. I forgot how pleasant and not-at-all stressful it is to cram my body between other people’s bodies every morning and evening during rush hour in a subway car that more often than not halts in between stops just long enough for me to feel a bit claustrophobic and like I might elbow the lady with the too-big-bag that she’s not holding in front of her, but NEXT to her, or pass out and let these newly familiar people catch me as I tumble. Think about that the next time you complain about traffic on the 104E. This lovely little recipe takes all of 10 minutes to prepare and it is so. flippin. good. 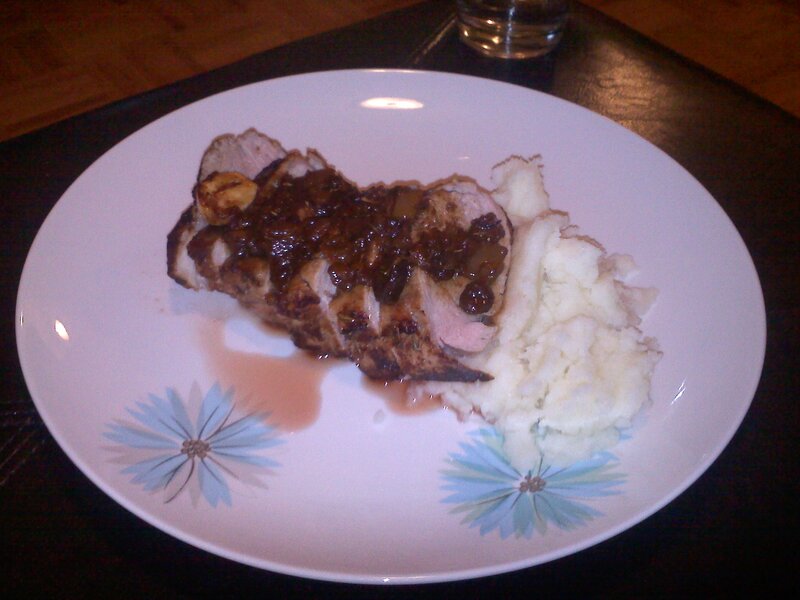 Pork loin is one of those cuts of meat that is so worth the extra couple bucks it costs in the grocery store. You throw it in the oven and forget about it until 25 – 30 minutes later it pops out, smelling incredible and ready to be inhaled. …Just me? Spread mustard all over pork loin. On a shallow plate, add Panko, garlic, garlic powder, and rosemary and stir to combine. 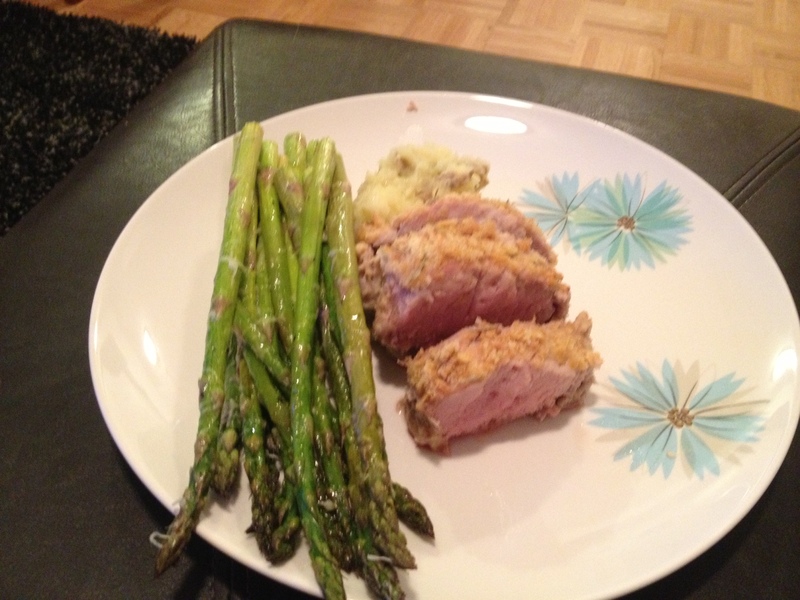 Place pork loin on plate and coat completely in bread crumb mixture. Shake off excess. Spray a shallow baking dish with non-stick cooking spray. Place pork loin in the dish and give the pork itself a good spray with the cooking spray. Cook for 25 – 30 minutes or until the pork juices run clear. Let sit for 5 minutes. Slice into slices. Toss asparagus with olive oil. Spread across a baking sheet lined with foil. Sprinkle salt and pepper on top. Bake at 400 degrees for 10 minutes (the last 10 minutes of your pork cooking!). Sprinkle cheese on top. Bake for another 3 – 4 minutes or until cheese is melted. If you don’t know how to make mashed potatoes, get out of my face. I love any meal I can throw in one pot in the middle of the day and serve with pride 6 hours later after 15 minutes of prep. Some cooks might dispute this claim, but I’m gonna go ahead and say it’s hard to mess up a pork shoulder, so this is also a dish that takes zero skill to master. If you don’t have a slow cooker, just throw this in a roasting pan in your oven at 250 degrees for the same amount of time. You might want to baste it mid-cook so it doesn’t dry out, though. Add pork shoulder, chipotles, garlic, spices and beer to the slow cooker. Cook on low for 2 – 3 hours or until the meat is easily pulled apart with two forks. (NOTE: If cooking in the oven, baste at 1 and 2 hours). Heat up tortillas between 2 damp paper towels in the microwave for a minute or two. Top with pulled pork, cilantro, onion, and a squeeze of lime. Plate alongside another wedge of lime. 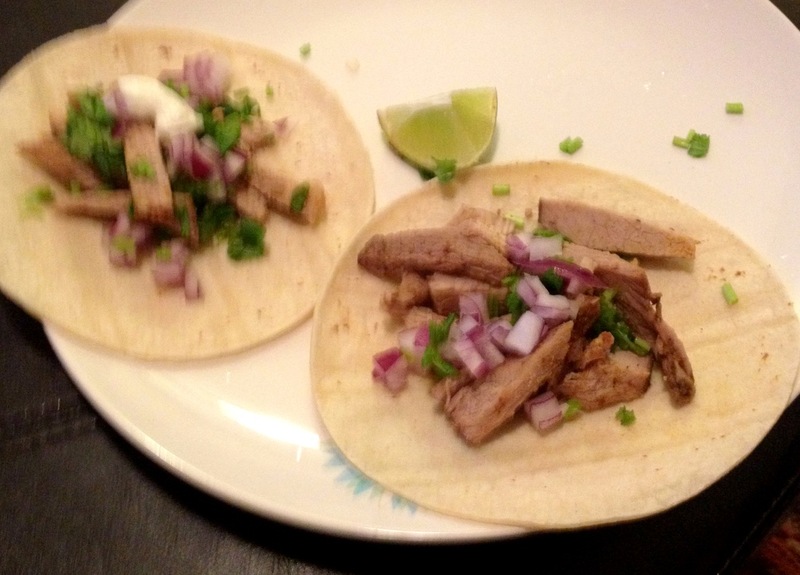 *NOTE: I like these to have just a tiny hint of spiciness so I throw the chipotle peppers into the slow cooker whole and just let the flavor seep into the pork, and then fish the whole peppers out before serving. If you like these spicier, you can dice up the peppers and throw them into the slow cooker. That way you can serve them up along with the pork for a real kick in the pants. This past weekend I went all out and made a super special dinner as a thank you to two friends. 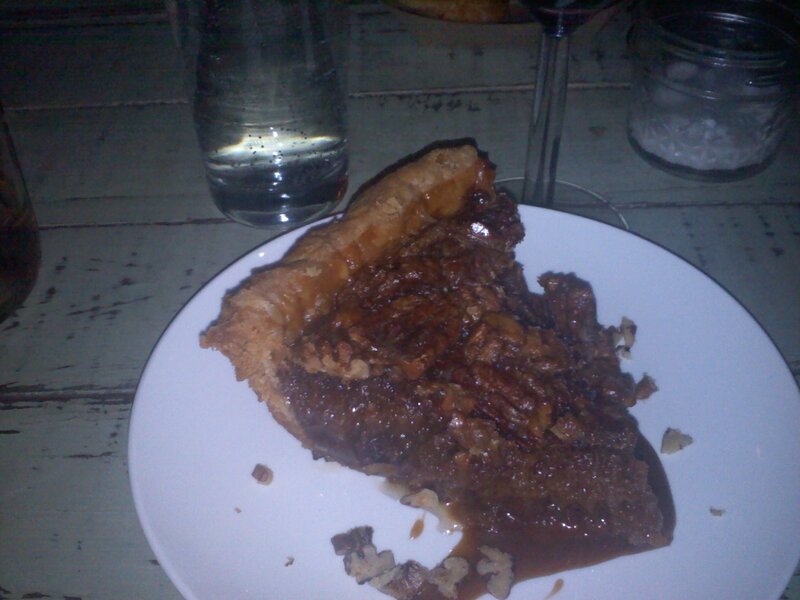 I wanted the dinner to be out-of-this-world memorable, and with dishes we don’t eat everyday. I remembered that I had a recipe for pork shoulder tucked away in my inbox and this seemed like the perfect opportunity to try it out. I called my local pork store, Sorriso’s, ordered a four pound pork shoulder, and annoyed everyone in my presence for two solid days talking about how great this dinner was going to be. The dinner was comprised of four main dishes, and I’ll be sharing them over the course of the week. Just so y’all know, none of this was very complicated but it came together to be a pretty epic dinner. Four bottles of wine didn’t hurt anybody, either. Mix together paprika, red pepper flakes, cayenne pepper, salt, and pepper in a small bowl. 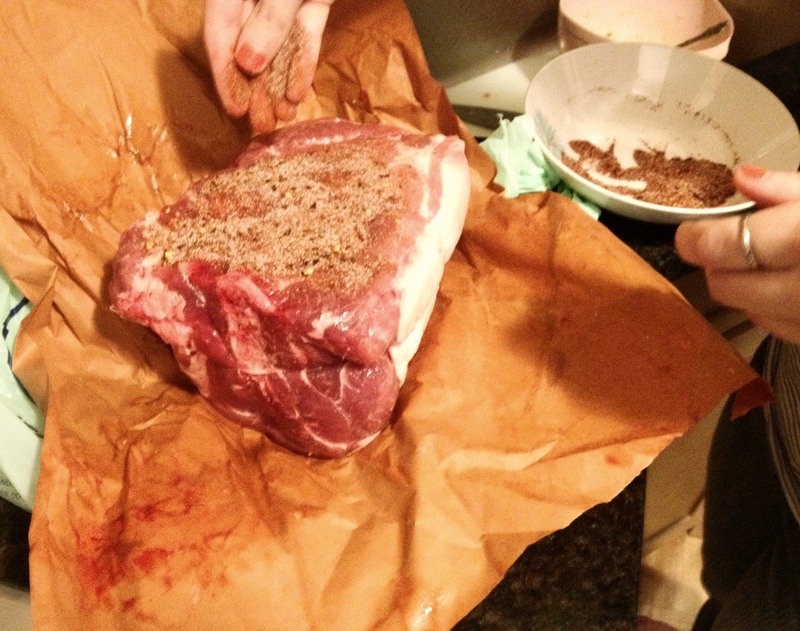 Rub the pork shoulder all over with the spices and let sit 30 minutes. Set pork in a roasting pan and put in oven for around 5 hours, or until the bone moves around easily with little to no resistance. When the pork has been in the oven for 4 hours and 45 minutes, start making the glaze. Mix together the brown sugar and bourbon in a small saucepan and turn heat to medium/low. Simmer the sugar and bourbon for around 8 to 10 minutes or until reduced by 1/4. Brush 1/3 of the glaze over the pork shoulder and return to oven. Glaze twice more, every 10 minutes. After 30 more minutes of roasting, remove the pork from the oven. Let sit for 15 minutes before pulling meat off the bones and serving. 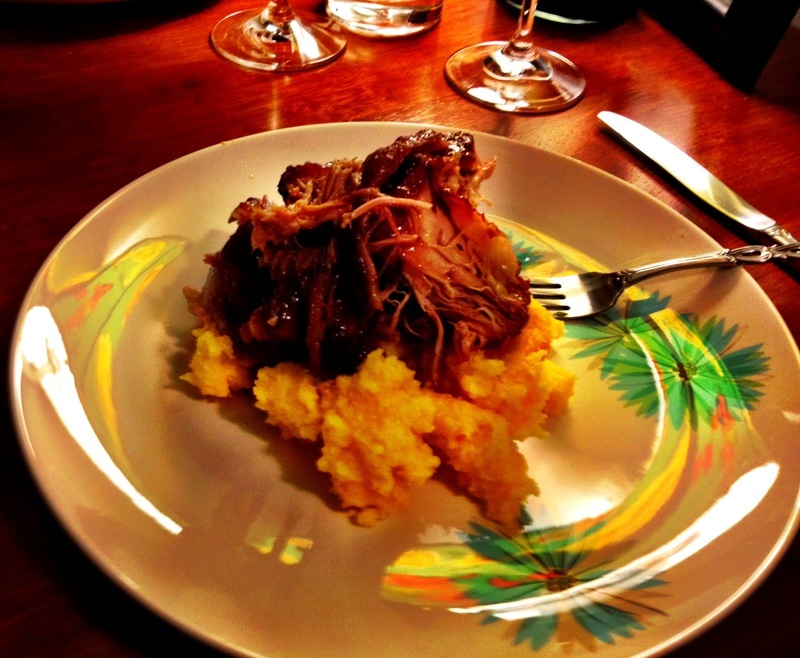 Serve over basic polenta or mashed potatoes. 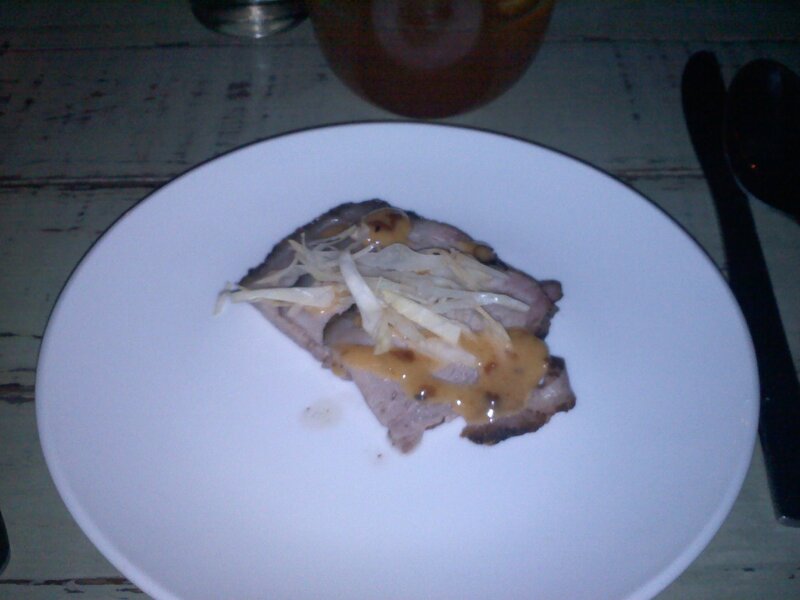 *It’s worth mentioning that pork shoulder is kinda pricey, but well worth the money. A cheap pork shoulder will yield tough meat, and you definitely want this to be as moist and juicy as possible. A long, long time ago I bought a pork loin. Okay, not THAT long ago, but for the purposes of creating a dramatic atmosphere without the benefit of music, let’s just say it was a long, long time ago. Then I got broke. $6-in-my-checking-account kind of broke. Nothing like poverty to make a girl resourceful. So with that giant hunk of pork in my freezer (get your minds out of the gutter, you dirt bags) and a jar of homemade pear and ginger chutney in my cupboard, I decided this was the weekend to finally tackle the pig. In a small bowl, mix together the white wine, 1 Tbsp of olive oil, garlic, chutney, and thyme. Place pork in a shallow bowl and cover with the wine mixture. Use a spoon to distribute the mixture all over the pork so it is well covered. Cover the bowl with plastic wrap (I put mine in a Pyrex dish and put the lid on it) and let it sit at room temperature for an hour, or in the refrigerator for 3 hours. Heat the remaining 2 Tbsp of olive oil in a large oven-proof skillet on medium/high heat. Brown your marinated meat on each side, 2 minutes each side. Pour wine marinade over the pork and place the whole skillet in the oven. Cook for 20 minutes, or until the pork registers around 140 degrees on a meat thermometer. Place pork on the cutting board and cover with a foil tent. Let rest for 5 minutes before slicing into rounds and serving. Pour pan juices over the pork once plated. *You can use any kind of chutney you want. Apple and pear work best with pork, and this particular chutney was a KNOCKOUT. The BF kept saying, “It’s so… soft.” And it really was ridiculously tender. This dish takes almost zero culinary knowledge and is a great recipe to make for someone special on a date night. It looks super fancy, tastes incredible, and will get you major props. 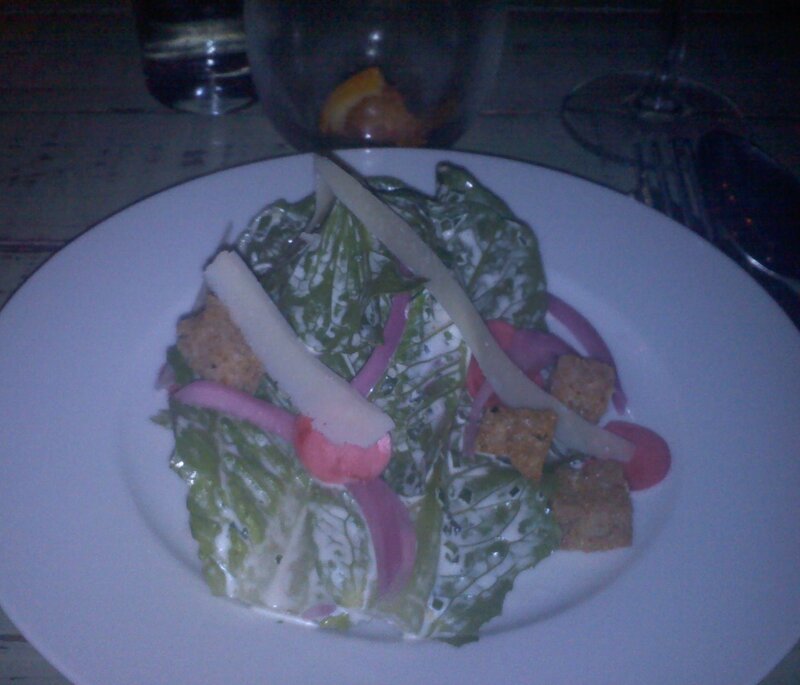 I’ve found lately that I haven’t really been eating out at many fantastic restaurants. I’m not sure if it’s the cold weather or the lack of funds, but I don’t really have a ton to tell you about by way of must-visit-spots. Until… last night. CityGrit Presents Jim ‘N Nick’s: City Grit is a “culinary salon”, part supper club part experimental pop-up restaurant. Chef Sarah Simmons and Jeremie Kittredge, the brains behind the brilliance, wanted to provide a unique culinary experience for discerning New York diners by hosting weekly dinners at an old school in Nolita, occasionally catered by chefs and cookbook authors from all over the country. The menu and wine list are always changing, and for a reasonable ticket price, anyone can attend. It’s haute cuisine with a Southern flair, served to the masses with a warm and welcoming hug-from-your-mama vibe about it. Who could ask for anything more? 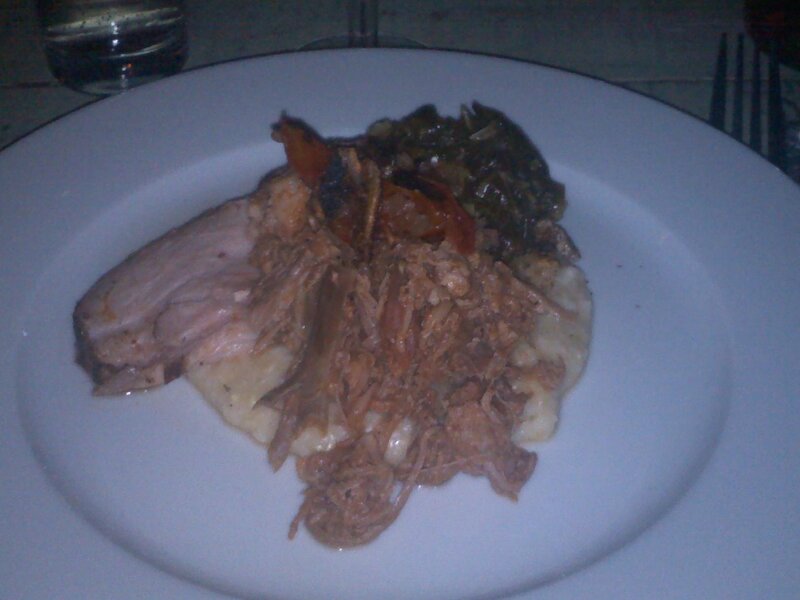 From Jim ‘N Nick’s, and preparing the meal for the Thursday, January 19th dinner was Chef Drew Robinson. Chef Robinson opened the evening by addresses the 82-person dining room with a quick speech about the importance of pig (you don’t have to tell me, Chef) and the Southern mentality behind preparing it. One of the things that struck me most about this dining experience is the intense passion and love of food that the people involved put into their meals. You may as well be at your grandmother’s kitchen table for all the love that goes into these dishes. Verdict: Do I really even have to say it? This meal was incredible. I was literally spreading pimento cheese on pickled okra, coating my corn muffins in pecan pie filling, closing my eyes to savor the deliciously sweet and tender pork… this is BBQ done right, my friends. It’s not haughty or pretentious, just freaking delicious. PS… can someone please buy me a camera? Kthxbye. Fall is by far my favorite season. Sweaters, boots, crispy apples, baked goods, pumpkins, leaves changing colors… hand me a Hudson Bay blanket and point me to the nearest easy chair, kids. It’s all I’ll ever need in this world. Cue today’s Fall Football meal. I wanted to make something that would warm the bellies of the boys in my life, but also allow me to watch the games all day without standing over the stove for 6 hours straight. For the next few days I’ll be posting each individual recipe from this meal because they all turned out SO well. And by Friday you’ll be ready to make it all for your own football party on Sunday. Heat olive oil over medium/high heat in a large pot. Add onion and saute for around 6 minutes. Add jalapeno and garlic and saute for 1 minutes. Add ground beef and cook until the meat is browned. Add chili powder, paprika, and cinnamon, then mix in tomatoes with juices, kidney beans, and beef broth. Bring heat up to a boil. Reduce heat to a simmer and let chili simmer for 45 minutes. Add salt and pepper to taste. 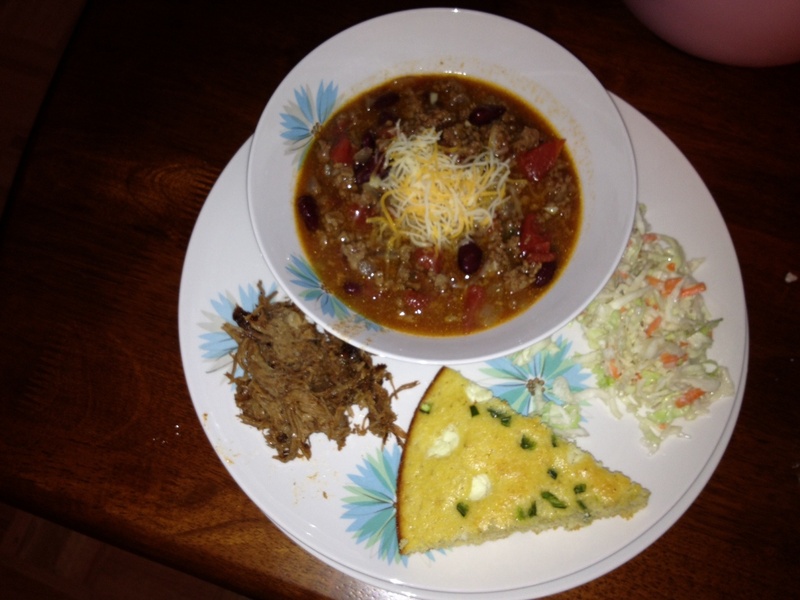 Serve chili in bowls with shredded cheese, sour cream, and/or chives. *I used one jalapeno because I’m not a huge fan of spicy food. If you love spicy, you can add 3 jalapenos chopped with seeds. Recipes for jalapeno goat cheese cornbread and coleslaw coming soon!